This Website Is No Longer Active. : Would you believe it ! "Thieving and Corrupt" Scumbag MP's are granted legal aid . Would you believe it ! "Thieving and Corrupt" Scumbag MP's are granted legal aid . Three Labour politicians mired in the parliamentary expenses scandal have been granted legal aid for their courtroom defence - paid for by the taxpayer. 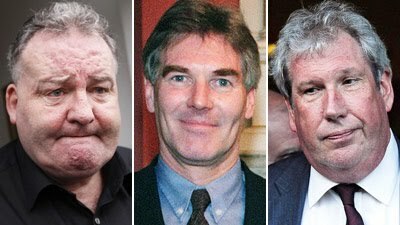 David Chaytor, Elliot Morley and Jim Devine are all due to go on trial later this year accused of theft by false accounting. The three are accused of stealing almost £60,000 in allowances through false mortgage applications, rent claims and invoices for services. Jim Devine, David Chaytor and Elliot Morley deny charges of theft. But the cost of preparing their defence and of paying their legal representatives is likely to run into six figures, depending on the length of the trial. Yet, the cost could spiral far higher as the men threaten to take their battle to have the case against them thrown out to the Supreme Court. The three ex-MPs have brought together some of the country's most eminent barristers, who can charge hundreds of pounds an hour, to fight their cases. An HM Courts Service spokesman confirmed an application for legal aid for the three men was granted last Friday. Scotland Yard said its inquiry into the expenses scandal has cost £508,500 so far, with the final bill likely to be considerably higher. A spokesman for Edward Fitzgerald QC, who is due to represent at least two of the MPs at the crown court, said he was not aware of a legal aid decision. Chaytor, the 60-year-old representative for Bury North, from Todmorden in Lancashire, is accused of falsely claiming rent on a London flat he owned, falsely filing invoices for IT work and renting a property from his mother, against regulations. He has no plans to stand again for this seat in the upcoming General Election. Scunthorpe's ex-MP Morley, 57, of Winterton in North Lincolnshire, allegedly falsely claimed £30,428 in interest payments between 2004 and 2007 towards a mortgage on his home which he had already paid off. He will not stand for re-election. Livingston's former MP Devine, 56, of Bathgate in West Lothian, is said to have wrongly submitted two invoices worth a total of £5,505 for services provided by Armstrong Printing Limited. He will not be standing again. Devine also faces a second charge alleging that he dishonestly claimed cleaning and maintenance costs of £3,240 by submitting false invoices from Tom O'Donnell Hygiene and Cleaning Services. The politicians could face up to seven years in jail if found guilty of stealing taxpayers' cash. Just when you think they couldn't stoop any lower, we have this disgusting legal debacle. If this doesn't wake up our people, and move them to vote for the only decent, honest party the "British" National Party. Then God help our children. We all know that they are guilty but I bet you not one of them will go to jail. "Out with the Old and in with the New." It's the BNP this time for me and my family.